Why is the symbol of the cup of the New Covenant in Jesus’ blood so important? Part 1 of this article discussed how, in drinking the wine during the Lord’s Supper, we show His death and its application to us, but we also picture taking His life into us, which is what we really do when we take His words into us. Now, let’s focus on the importance of the symbol of the cup of the New Covenant in Jesus’ blood. Speaking of the cup of wine, Jesus said, “This cup is the new covenant in my blood, which is poured out for you” (Luke 22:20; see also 1 Corinthians 11:25). Jesus didn’t say these words without intending them to have significant meaning. Why did He not simply refer to the wine? Why did he refer to the cup? Literally, a cup is merely a container. The Bible uses the word cup to symbolically represent whatever it is supposed to be holding. Thus, it is a symbol that takes on many meanings. 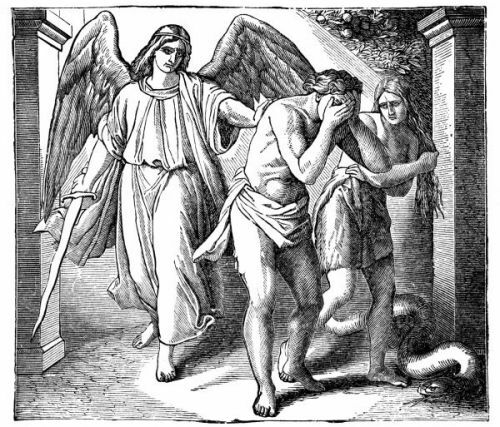 In Matthew 26:39, Jesus’ flesh being upset over what was to come, He prayed, “My Father, if it is possible, let this cup pass away from me; nevertheless, not what I desire, but what you desire.” Although His flesh was troubling Him, it was inevitable that He would end His prayer by deferring to God’s will. There was never a question of whether Jesus would drink that “cup.” It was the central reason He had come to Earth (Matthew 16:21-23; Luke 24:44-47). As He said a short time later to Peter, “Put the sword into its sheath. The cup which the Father has given me, shall I not surely drink it?” (John 18:11). So, the literal cup that Jesus referred to contained wine, the symbol of His blood, which stood for His life. Jesus called the cup “the new covenant in my blood, which is poured out for you.” Of what does the New Covenant consist? Words. The words of life. Again, we see a direct relationship between Jesus’ blood and Jesus’ words and Jesus’ life. Exodus 24 tells us of the dedication of the Old Covenant. Verse 3 says, “Moses came and told the people all the LORD’s words, and all the ordinances; and all the people answered with one voice, and said, ‘All the words which the LORD has spoken will we do.’” They didn’t know it, but they had just spoken their death sentence. They could not do the words. Thus, Paul calls the Old Covenant the service of death (2 Corinthians 3:7). These were words that killed. As we read on in Exodus 24, we see that Moses sacrificed cattle (verse 5), and then he poured half the blood on the altar he’d made (verse 6). He then read the words of the Old Covenant to the people, who again agreed to obey the covenant (verse 7). Moses next “took the blood, and sprinkled it on the people, and said, ‘Look, this is the blood of the covenant, which the LORD has made with you concerning all these words.’” (verse 8). With a promise the people could not keep and the blood of animals that could not take away sin (Hebrews 10:4) sprinkled externally onto them, so began the Old Covenant. As was pictured by Moses’ sacrifice of the animals, the New Covenant had to be instituted with blood. As the sacrifice of the New Covenant was the once-for-all-time sacrifice of Jesus Christ, Jesus had to die and shed His blood to begin the New Covenant (Hebrews 9:15-18). 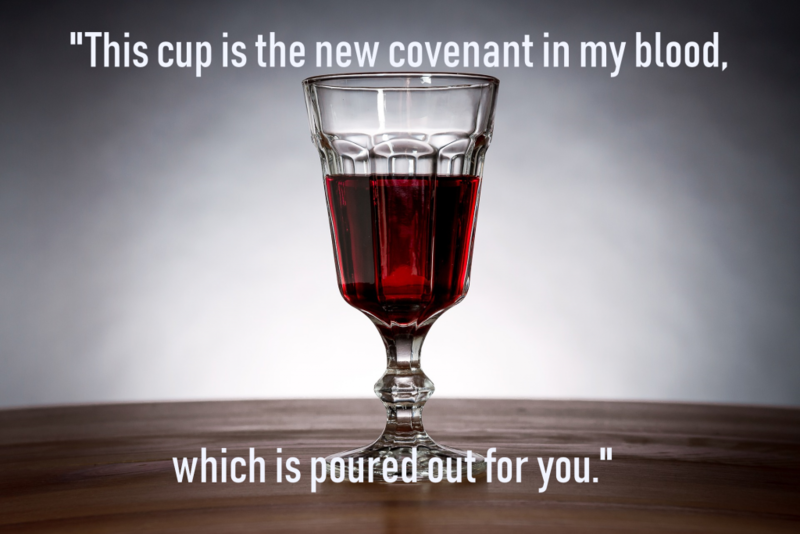 This New Covenant that required Jesus’ death is what is pictured by the cup of wine in the Lord’s Supper. The New Covenant was established by the death of Jesus. The shedding of His blood was the ultimate sacrifice once for all, perfecting in perpetuity those (individual believers in the past, present, and future) who are being sanctified (Hebrews 10:14). We picture taking Christ’s life into us by drinking the wine, and we take Christ’s life into us for real by reading the Word of God. Our reading of the Word of God is made effective by the Spirit who thus writes God’s law of love into our hearts and minds (Jeremiah 31:33; Hebrews 8:10). Writing, of course, consists of words. And remember that the covenant, pictured by the cup of wine, is, after all, words—words that are part of the Word of God. And, who is the Word of God? “In the beginning was the Word, and the Word was with God, and the Word was God…. The Word became flesh, and lived among us. We saw his glory, such glory as of the one and only Son of the Father, full of grace and truth” (John 1:1, 14). Jesus is the living Word of God. The written Word of God must then be the revelation of His mind. The focal point of the Word of God is Jesus, particularly as He is the sacrificial atonement of His New Covenant. Further, there are Old Testament prophecies of the Messiah that state that the One prophesied—the Christ—is the New Covenant: “I the lord God called you in righteousness, and I shall hold your hand, and I will strengthen you; and I gave you for a covenant of a race, for a light of nations; to open the eyes of the blind, to lead out of bonds ones being tied; from out of the house of prison also ones sitting in darkness” (Isaiah 42:6-7, Apostolic Bible Polyglot); “Thus says the lord, In the accepted time I heeded you, and in the day of deliverance I helped you, and I shaped you, and I gave you for a covenant of nations, to establish the earth, and to inherit desolate inheritances. 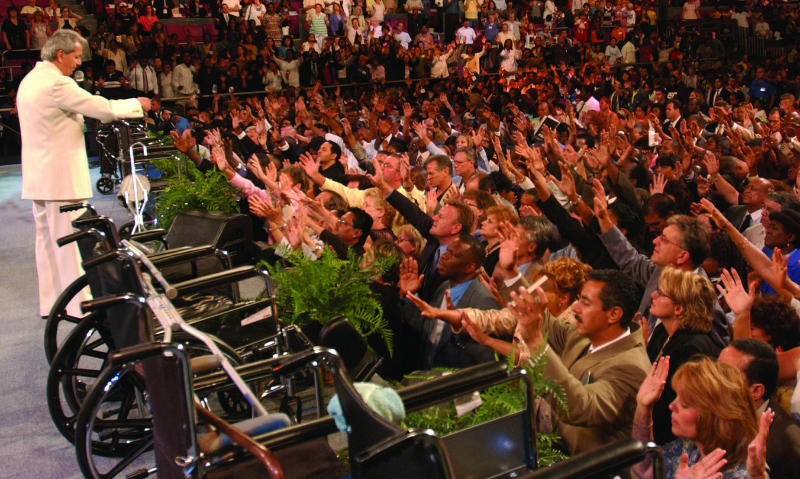 Saying to the ones in bonds, Come forth! and to the ones in the darkness to be uncovered. In all the ways they shall be grazing, even in all the roads of their pasture” (Isaiah 49:8-9, Apostolic Bible Polyglot). Of course, this really should be obvious since the life Jesus gave was His own. The wine pictures the blood that stands for the life of Jesus, and it is contained in the cup of the New Covenant. Thus, since the cup holds the symbol of the life of Jesus (which is, of course, Jesus), then Jesus is the New Covenant. 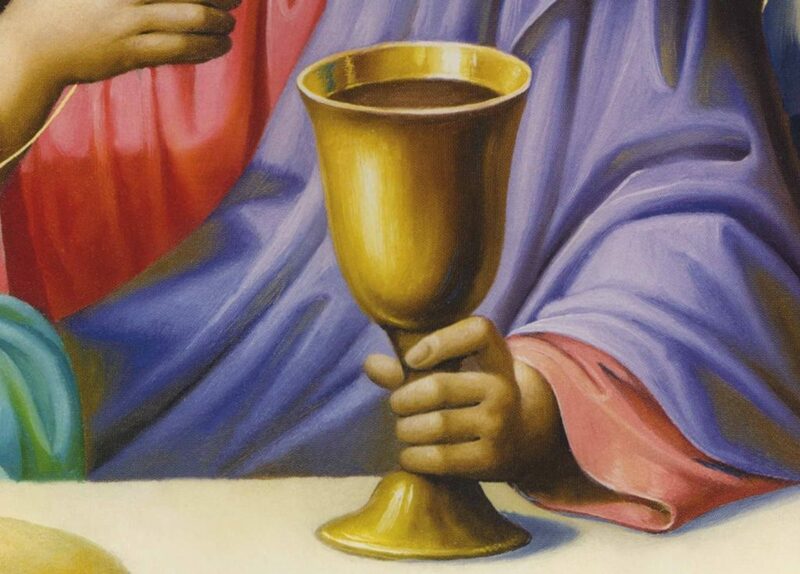 When we drink the wine of that cup, we picture taking into us the life of Jesus. His life is the New Covenant in His blood. The New Covenant consists of His words, which He says are life. We live in a postmodern era when the concept of words with objective meanings is seen as restricting and the Bible is read merely to stimulate our subjective thoughts. Whatever interpretation someone might give is met with, “Wow, cool! If that works for you, that’s great.” But Peter tells us that “no prophecy of Scripture is of private interpretation” (2 Peter 1:20). “Private” is from the Greek word, idios. It means, “Pertaining to self.” As believers, we must never allow ourselves to be swept up with the flood of such nonsense (Luke 6:46-49). If we forsake His words, we forsake Him, and put something else in His place to worship and follow—ourselves and our own misguided thoughts. Why did Jesus call the cup of wine in the Lord’s Supper the New Covenant in His blood? Because it is a symbolic representation of the New Covenant, ratified in Jesus’ blood. That covenant is Jesus because it consists of the Word of God’s words and was put into effect by Him giving His life. It begins a new life—that life being Jesus’ life—for us. The cup of wine stands for the blood of Jesus, for the life of Jesus, and for the words of the covenant. The words are essential. Without the words, it loses meaning. The bread and wine perform no magic. Give them to a person ignorant of the Gospel, and that person will be ignorant still. The words of the Old Covenant killed; the people were incapable of keeping them. The words of the New Covenant are eternal life to those who trust them: “Most certainly I tell you, he who hears my word, and believes him who sent me, has eternal life, and doesn’t come into judgement, but has passed out of death into life” (John 5:24). Those who slight the written Word of God also slight the living Word of God: “The one who rejects Me and does not receive My Words has that judging him: the Word which I spoke, that will judge him in the last Day” (John 12:48, Literal Translation of the Holy Bible). Copyright © 2019 Peter Ditzel Permissions Statement. Jesus said, “This cup is the new covenant in my blood, which is poured out for you” (Luke 22:20; see also 1 Corinthians 11:25). Jesus didn’t say these words without intending them to have significant meaning. Why did He not simply refer to the wine? Why did he refer to the cup? In Luke 22, we read of Jesus’ appointment of the Lord’s Supper as a memorial of His death. When He came to the cup of wine, He said, “This cup is the new covenant in my blood, which is poured out for you” (Luke 22:20; see also 1 Corinthians 11:25). Have you ever wondered why Jesus used this wording? Why did He say that the cup of wine is the New Covenant in His blood? There is something very important for us to learn here. Is the Old Testament Wrong? If the Old Testament tells us “An eye for an eye, and a tooth for a tooth,” and Jesus says, “But I tell you, don’t resist him who is evil,” does that mean the Old Testament is wrong? If Christians are under the New Covenant and not the Old, does that mean that we should rip the Old Testament out of our Bibles? I want to warn you against neo-Marcionism. Some preachers and writers either now promote or are just on the verge of blindly rushing into this dangerous belief. Around the middle of the second century AD, Marcion of Sinope began spreading his belief system that came to be known as Marcionism. One of his central teachings was the claim that the God of the Old Testament couldn’t be the God of the New Testament. The God of the New Testament sent His Son Jesus to be our Savior. The Old Testament God was a legalistic God of retribution. Marcion’s solution to this seeming contradiction was to reject the Old Testament from the Christian canon. Today, we have teachers who are saying that the God that Jesus reveals is so different from the God of the Old Testament that the Old Testament must be wrong. Other preachers are standing at their pulpits and suggesting that the Old Testament, with its Law of Moses, is a hindrance to the Gospel and, thus, we should unhitch the Old Testament. I grant that the Old Testament can present problems to the uninformed. I also grant that for centuries, teachers have often had the problem of wrongly bringing the Old Covenant into the New. The neo-Marcionites are likely reacting to this and have good intentions. Yet, I have no doubt most bad theology is the result of good intentions. But is the answer to the misuse of the Old Testament to just jettison it? After all, isn’t all of the Bible the Word of God? Does God give us another solution to this problem? The core reason Marcion detached the Old Testament was that he misunderstood it and its relationship to the New Testament. Neo-Marcionites have the same problem. Through the centuries, vast numbers of Christians have had a poor understanding of the relationship between the Old and New Testaments. Perhaps the most common manifestation of the problem is what I would call flat covenant theology—not seeing the true distinction between the testaments and failing to grasp that the New is the superior revelation and the interpreting testament. Even many who have some notion of the New Testament as a superior revelation often see the relationship between the testaments as being expressed by the terms Old/immature and New/mature. They see the same covenant in the Old and New Testaments with the New Testament merely introducing a better, more mature administration of it. New Covenant Theology addresses these deficient and misleading views by teaching that the relationship between the testaments is one of type and antitype. In the Old Testament, we find the history of the temporary and shadowy Old Covenant of law and works; in the New Testament, is the eternal and real New Covenant of grace and faith. But some people, rushing headlong away from flat covenant theology are apparently not satisfied with sound, New Covenant Theology. They see a distinction between the covenants, but instead of seeing the type/antitype relationship, they see the two covenants as divided into a wrong/right pattern, or at least they consider the Old Testament as so flawed and inferior that it is a liability and not worth hanging on to. These people point out differences between the Old and New Testaments and declare that they prove that the Old Testament contains errors. After all, they say, the Old and New Testaments contain so many differences that they both cannot be correct. One must be wrong, and that’s more likely to be the Old Testament. By errors, it’s not always clear whether they mean textual errors (i.e. the Bible does not faithfully record what was said or what happened), or whether plain statements that are not textual errors (e.g. “The LORD sent fiery serpents amongst the people, and they bit the people. Many people of Israel died”—Numbers 21:6) are factual errors, or whether they believe God actually made mistakes (e.g. God made a mistake to say, “An eye for an eye, and a tooth for a tooth” and Jesus corrected this error). Is the Old Testament wrong? Does is contain errors? Should we just ditch it because it causes more trouble than it’s worth? The law of non-contradiction states that two contradictory propositions cannot both be true. Yet, two seemingly contradictory things can actually both be true under different circumstances. God is perfectly righteous. His standards are perfect. God’s laws to Israel were merely types of His righteousness. After Moses delivered these laws to the people of Israel, they agreed to them and said, “All that the LORD has spoken we will do” (Exodus 19:8). But, of course, God knew they would not do them. His real purpose was to teach through Israel’s bad example that humanity is so sinful that no one can consistently obey even the shadows of His righteousness. No one is able to attain his or her own righteousness. All need a Savior. Most of the Jews never understood that lesson. They became puffed up in thinking they were living up to God’s standards. Those who denigrate the Old Testament should note that Jesus never said the Old Testament was wrong. The Old Covenant only had authority over Israel. Jesus pointed out that even that limited authority was drawing to a close because He was going to fulfill the law and end it. When Jesus spoke, He knew that soon no one would have to try to keep the law or attain God’s perfect standards to be righteous. Jew and Gentile could just trust Him as Savior. He would rescue all believers from their hopeless situation. By His paying the penalty of the law for us and putting us into the New Covenant under which there is no condemnation, we would then be free to grow in love as He empowers us through the Holy Spirit. We wouldn’t have to worry about failing because there is no condemnation under the New Covenant. That way, we could keep trying and growing in love. Love perfectly expressed is God’s holy and righteous standard, Jesus has met it, and His righteousness covers us. In John 10:35, Jesus said, “Scripture cannot be broken.” Jesus does not contradict the Old Testament. It had its purpose. Jesus came to end it and begin the New Testament. We can still learn much from the Old Testament because it is shadows pointing to Christ and the New Covenant. Look at it this way: Jesus is the body or substance or reality that casts a shadow into the Old Testament (Colossians 2:16-17; Hebrews 10:1). The Old and New Testaments are both the Word of God. They are both God-breathed, but for different purposes. The button to work a window in a car is as much a part of the car as the crankshaft. But they don’t serve the same purpose and are not of equal importance. Just as Paul says of the Law, “The law indeed is holy, and the commandment holy, and righteous, and good,” (Romans 7:12), the entire Old Testament is holy, righteous, and good. But the New Testament is of greater importance to us now under the New Covenant. Both dropping the Old Testament altogether and giving it equal weight to the New Testament are serious errors. If we say there are contradictions and mistakes in the Old Testament, we are setting a dangerous precedent. We will end up picking and choosing what we like and rejecting what we don’t, and we will soon find ourselves far from the truth. Yes, we have the Holy Spirit, but we must also remember that we are still flawed humans who can deceive ourselves. Perhaps a good analogy is that the Holy Spirit is our locomotive who keeps us going forward, but the Bible is the track that keeps us within the truth. One of the people I feel is in danger of falling into neo-Marcionism is Andy Stanley. I’m not one of his followers, so I’m not an authority on everything he’s said. But because he’s been in the news lately, I’ve looked into some of what he’s said. Some of what he asserts rightly exposes the serious error of giving equal weight to the Old and New Testaments. But I also see that, like many today, he seems to prefer hip and contemporary sound bites over theological precision. So, some of the criticism aimed at him is deserved. Stanley has been faulted for saying, “when it comes to stumbling blocks to faith, the Old Testament is right up there at the top of the list” (Irresistible: Reclaiming the New that Jesus Unleashed for the World, 280). In this same book, he later says, “Would you consider unhitching your teaching of what it means to follow Jesus from all things old covenant?” (315). He has also apparently said, “[First century] Church leaders unhitched the church from the worldview, value system, and regulations of the Jewish scriptures,” and, “Peter, James, Paul elected to unhitch the Christian faith from their Jewish scriptures, and my friends, we must as well” (“Christians Must ‘Unhitch’ Old Testament From Their Faith, Says Andy Stanley”). He certainly likes the word “unhitch.” It is the first and last quotes that I have the most problem with. The Old Testament needn’t be a problem if preachers were to teach its true purpose and its proper relationship to believers under the New Covenant. I have no problem with unhitching Christian teaching from the “worldview, value system, and regulations of the Jewish scriptures” as long as that simply means that we are not to take them as our own, and I’ll assume that the quote from page 315 basically means the same thing. But none of this adds up to or excuses the last statement. Peter, James, and Paul did not unhitch the Christian faith from the Jewish Scriptures, and we must not either. All Peter, James, and Paul did was put the Hebrew (better descriptive) Scriptures in their proper place. Now, I’ll admit that if I were a prisoner being sent to a concentration camp with a choice of taking only one book with me, and the Old and New Testaments counted as two books, I would take the New Testament. It is most certainly the better revelation and the one that applies directly to me as a Christian. Nevertheless, though not as clearly and directly as the New Testament, the Old Testament Scriptures are able to make us “wise for salvation through faith, which is in Christ Jesus” and are “God-breathed and profitable for teaching, for reproof, for correction, and for instruction in righteousness, that the man of God may be complete, thoroughly equipped for every good work” (2 Timothy 3:16-17). We can go very wrong if we look at the Old Testament and say such things as, “The Bible says to keep a Sabbath day,” or, “The Bible tells us to slaughter our enemies.” But the fault is not in the Old Testament. The fault is our own for not first understanding the basic tenets of the New Testament before delving into the Old. When I was a teenager, for my first attempt at reading the Bible, I started in Genesis. I got to the myriad sacrifices in Leviticus and gave up because I found it boring and irrelevant. A few years later, I again became interested in the Bible and started with the Gospels. The difference was astounding! Unfortunately, I also started reading the literature of the Worldwide Church of God and became influenced by it. The Worldwide Church of God’s theology was as flat as west Texas. There was no understanding of what God was doing with the Old and New Covenants. It was merely, If the Bible says to do it, we need to do it. Thank God that He eventually brought me out of that church! When the Bible says that God told the Israelites through Moses to not eat pork, and so forth, it is not a textual error. Nor did the Israelites misunderstand God about these things. Nor was God wrong to say such things. It was right for the context, and that context was a step in God’s plan. But that context is not our context. We must see it for the historical event and shadow that it was. When we do that, it can be profitable. Do you know a new Christian or someone interested in learning? Encourage that person to first read the Gospels and the rest of the New Testament while delving into the Old Testament verses only as they are referenced in the New. Later, with that foundation, reading through the Old Testament can be profitable. We must not accuse the Old Testament of being wrong. We must not throw it out. We must not “unhitch” from it. But let’s make sure we see it from the perspective of a sound understanding of the New Testament. January 2019: I recently revisited some articles I wrote several years ago and made some necessary changes. These center on what Jesus was doing when He gave His “But I say unto you” statements in Matthew 5. Or, to put it another way, these changes concern whether Jesus was giving Christians a new law to obey. Why Did Jesus Say, “But I Tell You”? Why did Jesus refer to the Old Testament and then say, “But I tell you”? Was He giving us new laws to obey, or was He making an entirely different point? 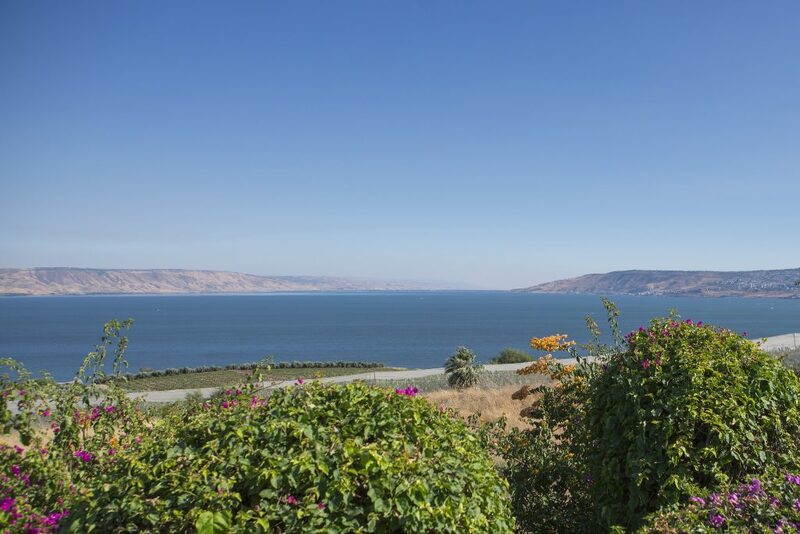 The Sea of Galilee from the Mount of Beatitudes. Photo by Itamar Grinberg for the Israeli Ministry of Tourism. The Bible records that Jesus many times used the words, “But I tell you,” or, as the King James Version puts it, “But I say unto you.” He did this after first either quoting the Old Testament or stating a principle from the Old Testament. Then He used what He said from the Old Testament as a springboard to teach a moral principle that sounded even stricter than the Old Testament. The Bible speaks of two powers that have different purposes and are mutually exclusive. Yet, many insist on teaching that we are under both. The two powers I have in mind are at opposite ends of the compass (Psalm 103:12). One is the power of sin and of death and of Satan, and the other the power of God for salvation. These two powers are mutually exclusive, each working against the other. As believers, we have experienced the power of God for salvation, and we remain safe under that power. And yet, Christian teachers abound (some of them even claiming New Covenant Theology) who insist that believers are under both powers and that the power of sin and of death and of Satan is the power we are to use to guide our lives and accomplish our sanctification. I want to show you where the Bible speaks of these powers and how we cannot be under both. 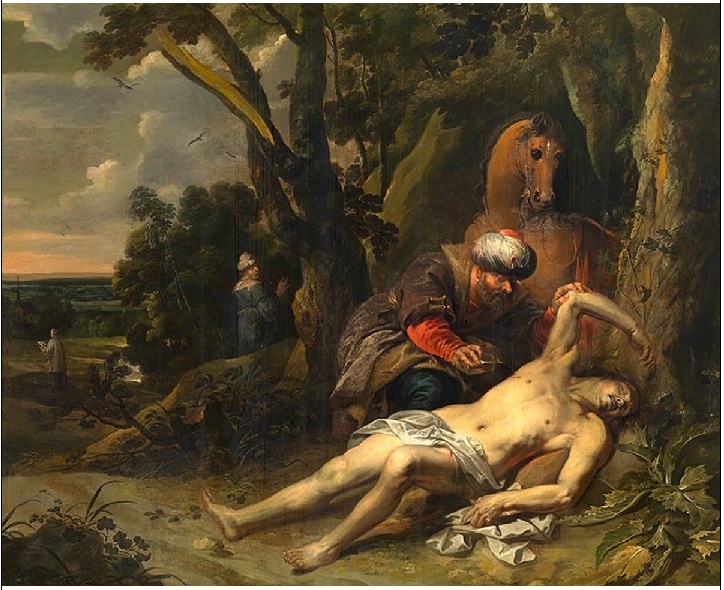 The Parables of Jesus>Who Is the Good Samaritan? Is Jesus’ Parable of the Good Samaritan merely a moral tale that He intended would encourage us to good works? Or, did He have something else in mind altogether? The Good Samaritan (1647) painted by Balthasar van Cortbemde (1612–1663). We’ve all heard of the Parable of the Good Samaritan. And, we’ve all heard that through this parable, Jesus was teaching that we should show love to our neighbor through self-sacrifice. “Good Samaritan” has even become a term used to describe a helpful or charitable person. According to this common interpretation, the parable teaches that when we see our neighbor in need, we are to help. Yet, if this is what Jesus is saying, it would mean that the half-dead man on the side of the road is the neighbor of the parable, the person in need, the neighbor we are supposed to help. A fact that is often missed, however, is that Jesus contradicted this accepted understanding by agreeing with the lawyer when he identified the neighbor in the parable as being, not the man in need of help, but the Samaritan who helped him. In fact, there are several difficulties with the standard definition of the parable that, when corrected by the Bible, completely change the meaning from the one assumed. What, then, is the answer to the lawyer’s question in Luke 10:29, “Who is my neighbor?” And who does the good Samaritan in the parable represent?